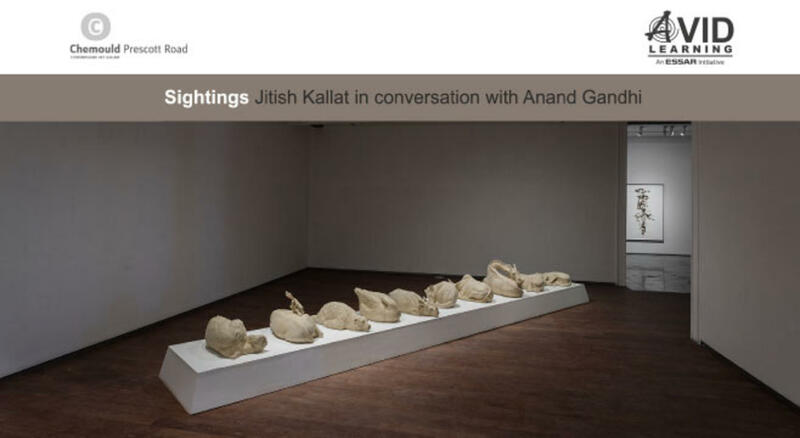 The closing moments of contemporary artist Jitish Kallat's solo exhibition titled Sightings at Chemould Prescott Road becomes the platform for a dialogue between Kallat and Ship of Theseus filmmaker Anand Gandhi. Recurring throughout the exhibition are the themes of time, sustenance, sleep, the interplay of scales and proximities, and evocations of the celestial. Planned as an informal walkthrough, join their conversation as it explores some of these ideas, offering a point of convergence to explore their shared interests and preoccupations. Jitish Kallat was born in Mumbai in 1974. His works are often distilled, poetic investigations into the fundamental themes of existence, interlacing several autobiographical, art-historical, political and celestial references. His works have been exhibited widely at museums and institutions including Tate Modern (London), Martin Gorpius Bau (Berlin), Gallery of Modern Art (Brisbane), Kunst Museum (Bern), Serpentine Gallery (London), Mori Art Museum (Tokyo), Palais de Beaux-Arts (Brussels), Hangar Bicocca (Milan), Busan Museum of Modern Art, Astrup Fearnley Museum of Modern Art (Oslo), ZKM Museum (Karlsruhe), Henie Onstad Kunstsenter (Oslo), Arken Museum of Moderne Kunst (Copenhagen), Institut Valencia d’Art Modern (Spain) and Art Museum (Tokyo). Anand Gandhi’s first feature film Ship of Theseus premiered at the Toronto International Film Festival ’12 and has since been recognized as “one of the most significant films to come out of India in decades” by critics and audiences, alike. It has won prizes at the international film festivals of London, Dubai, Mumbai, Transilvannia, Tokyo, and Hong Kong, and played at Rotterdam, Munich, LA and Sydney among others. It was put on a list of 15 “life-changing” films by the Critics’ Circle, UK. It was presented the National Award in 2014. In 2013, Anand was awarded the “Contribution to Jain Philosophy prize” by the Mumbai University. Anand has received the Rajeev Circle fellowship. He is also an INK fellow - a member of a group of young, global change-makers. In November 2015, Anand founded the Memesys Culture Lab.